^ Su, TP. ; Chen, TJ. ; Hwang, SJ. ; Chou, LF. ; Fan, AP. ; Chen, YC. (Aug 2002). “Utilization of psychotropic drugs in Taiwan: an overview of outpatient sector in 2000”. Zhonghua Yi Xue Za Zhi (Taipei). 65 (8): 378–91. PMID 12455808. ^ “Benzodiazepine Names”. non-benzodiazepines.org.uk. Archived from the original on 2008-12-08. Retrieved 2008-12-29. ^ Neville, GA.; Beckstead, HD. ; Shurvell, HF. (Feb 1994). “A Fourier transform-Raman and infrared vibrational study of delorazepam, fludiazepam, flurazepam, and tetrazepam”. J Pharm Sci. 83 (2): 143–51. doi:10.1002/jps.2600830207. PMID 7909552. ^ Tsuchiya, T.; Fukushima, H. (Apr 1978). “Effects of benzodiazepines and pentobarbitone on the gaba-ergic recurrent inhibition of hippocampal neurons”. Eur J Pharmacol. 48 (4): 421–4. doi:10.1016/0014-2999(78)90169-3. PMID 648585. ^ Nakatsuka, I.; Shimizu, H.; Asami, Y.; Katoh, T.; Hirose, A.; Yoshitake, A. (Jan 1985). 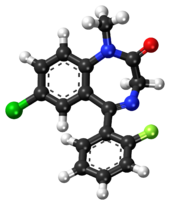 “Benzodiazepines and their metabolites: relationship between binding affinity to the benzodiazepine receptor and pharmacological activity”. Life Sci. 36 (2): 113–9. doi:10.1016/0024-3205(85)90089-X. PMID 2857046. ^ Okada, S.; Ichiki, K.; Tanokuchi, S.; Ishii, K.; Hamada, H.; Ota, Z. (1994). “Effect of an anxiolytic on lipid profile in non-insulin-dependent diabetes mellitus”. J Int Med Res. 22 (6): 338–42. PMID 7895897. ^ Okada, S.; Ichiki, K.; Tanokuchi, S.; Ishii, K.; Hamada, H.; Ota, Z. (1995). “Improvement of stress reduces glycosylated haemoglobin levels in patients with type 2 diabetes”. J Int Med Res. 23 (2): 119–22. PMID 7601294. ^ Okada, S.; Ichiki, K.; Tanokuchi, S.; Ishii, K.; Hamada, H.; Ota, Z. (1995). “How blood pressure in patients with non-insulin-dependent diabetes mellitus is influenced by stress”. J Int Med Res. 23 (5): 377–80. PMID 8529781. ^ Inoue, H.; Maeno, Y.; Iwasa, M.; Matoba, R.; Nagao, M. (Sep 2000). “Screening and determination of benzodiazepines in whole blood using solid-phase extraction and gas chromatography/mass spectrometry”. Forensic Sci Int. 113 (1–3): 367–73. doi:10.1016/S0379-0738(00)00226-7. PMID 10978650. ^ Shimamine, M.; Masunari, T.; Nakahara, Y. (1993). “[Studies on identification of drugs of abuse by diode array detection. I. Screening-test and identification of benzodiazepines by HPLC-DAD with ICOS software system]”. Eisei Shikenjo Hokoku (111): 47–56. PMID 7920567. (in Japanese) “エリスパンフルジアゼパム錠0.25mg，細粒0.1% Erispan (fludiazepam tablets 0.25 mg, fine granules 0.1%) Prescribing Information”. Sumitomo Dainippon Pharma.